(Quick Effect): You can discard this card; add 1 “Thunder Dragondark” from your Deck to your hand. If this card is banished, or sent from the field to the GY: You can add 1 “Thunder Dragon” card from your Deck to your hand, except “Thunder Dragondark”. You can only use 1 “Thunder Dragondark” effect per turn, and only once that turn. Thunder Dragondark is the decks RoTA. Dragondark, as specified in the first line, is your RoTA. Ditch to pull another of itself from your deck. If you banish it or it goes to the grave from the field, then you get the more conventional RoTA effect for the archetype. While the second effect is much better, the first effect being a Quick Effect lets you thin your deck on your opponent’s turn, limiting the chances of drawing a second copy of this during your turn. Not only that, but on your turn you can fire off your second copy of Dragondark, get the third, and still banish either of your copies to trigger the banished effect. Goes without saying though that the wider search option is the best though. Still, being able to pull all three copies of this card out by the end of your first turn (going second) just by having this card in your hand is pretty good. You can also use other copies of this card for any discard effects that you’d like, not losing out by not being able to search Dragondark again. So many cards activate the banish effect of this card, as well as all Thunder Dragon monsters, and with Dragondark being DARK that opens up Chaos builds to accelerate the process. Allure of Darkness the second or third copy of Dragondark and get your draw two and a free search. The only negatives of this card are the stats. Thunder Dragondark has the same terrible stats as Thunder Dragon except this is Dark. Otherwise a Level 5 Thunder-type with 1600 Atk and 1500 Def is just not good. However, the effects are ridiculous and yet balanced by being once per turn. The first effect works from the hand at the cost of discarding itself to search another copy of itself from the deck. It’s a Quick Effect as well which could be fun to interrupt some chains and obviously trigger other Thunder Dragons’ effects. The second effect triggers when Dragondark is sent from the field to the grave or is just banished from anywhere. You get to search any Thunder Dragon card except itself. That is the better search option, but it takes slightly more work for this to go from the field to the grave. Banishing makes this the easy choice with Allure, Gold Sarc, Chaos, etc. I’m glad you can only use one effect per turn and each one is only once per turn. They would be too powerful otherwise. Must run three Thunder Dragondark until they nerf something with a limit on the ban list. The final standard main deck Thunder Dragon monster, but not the last Thunder Dragon main deck monster we will look at *hint hint*, is easily the best one, Thunder Dragondark. Thunder Dragondark is a Level 5 DARK Thunder with 1600 ATK and 1500 DEF. Clearly this is a Dark version of the original Thunder Dragon, though I guess that was obvious enough to not need mention. The ATK and DEF wasn’t good on Thunder Dragon as a Level 5 and neither are good here, DARK is better than LIGHT in this case cause this card has the best banish effect of all the Thunder Dragons and Allure of Darkness becomes an option for this, Thunder is good as well. As a Quick Effect, you can discard this card to add 1 Thunder Dragondark from your deck to your hand. A one-for-one that is during either player’s turn for extra Thunder Dragon Titan benefits, and since you will likely be playing three Thunder Dragondark no matter where you put Thunder Dragons, this will only not be live if you don’t have any more Thunder Dragondarks in your deck. If this card is banished or sent from the field to the GY, you can add 1 Thunder Dragon card from your deck to your hand. Ah, there is the archetypal searcher. This is so easy to trigger with Gold Sarc, Allure of Darkness, any of the Chaos monsters, etc. Searching is almost mandatory for any archetype to stand somewhat of a chance, don’t even know if there are exceptions to this rule because searching is that important. This combos well with Thunder Dragonhawk and Gold Sarc which I’ll get into at a later time. 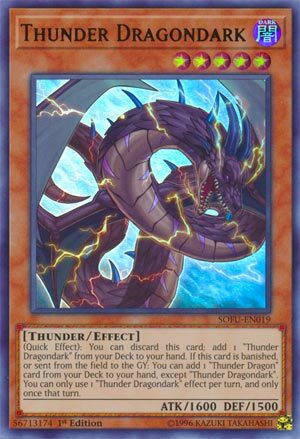 You can only use one Thunder Dragondark effect per turn and only once that turn, and this is likely the most important card to need this text, cause that can be some strong plusses and Thunder Dragon Titan abuse at the same time. Still a three off in anything with Thunder Dragons. Art: 4.25/5 A Dark Thunder Dragon looks better than a Light one, don’t know why the original is Green, tbh, but oh well. But you can retrieve a Thunder Dragon card, other than itself, of course, if this card is removed from play or sent from the Field to the Graveyard (still no condition as to how or by which player, which we still really appreciate). It’s almost asinine to me how easy these new support cards have made searching and cycling in the Deck…one could argue it moves as quickly as Thunder strikes. It’s still amazing as well how it opens up about any option you need…you’ll easily have the material you need (the specific material you need) based on what you discard or remove, to make your Deck go…making one of the brutish Fusions, or performing Link Summons. It doesn’t matter, and it’s awesome this Archetype has variants as well, as was mentioned last week too.